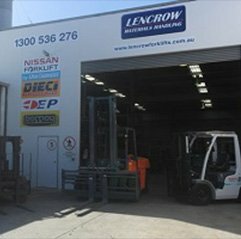 Lencrow Materials Handling branch in Melbourne was originally in the suburb of Dandenong. 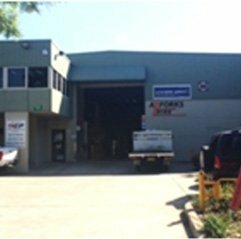 The branch was first established in 1991 trading under Pro-Fork Pty Ltd and specialised in electrical forklift repairs. Pro-fork established second hand sales, a hire fleet and spare parts sales as part of their services in the industry. Ross Grassick (Managing Director, Lencrow) and Mina Komodromos (State Manager, Lencrow Melbourne) met in 1995 and by the year 2000 Lencrow Materials Handling purchased Pro-Fork to expand the dealer network across the East Coast. 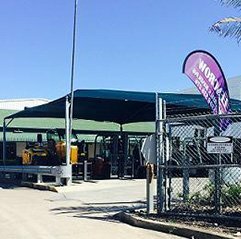 The branch in Melbourne had established more services, products and resources as part of the merger to provide a holistic range of service solutions for materials handling needs. Call the team today for personalised services. Lencrow Materials Handling is the number one supplier for EP Equipment, Manitex Liftking, Terex Reach Stackers, and Bomaq. We sell a massive range of new forklifts of renowned International brands that is hard to find with other suppliers in Australia, and we have included them in our hire fleet as well. No matter what type of application/task you require completing, we have a product to suit all types of material handling requirements. All our new forklifts are fully backed by 100% after sales service and support, and we have them in our hire fleet too, which includes over 3500 units countrywide. At Lencrow, we stock an enormous range of used forklifts of different brands in Melbourne. All used forklifts are inspected and evaluated at affordable prices. We have a committed team of experienced and qualified technicians who inspects all used forklifts prior to placing them for sale. Not sure, which used forklift you should consider buying for your next project? Well, our expert team is here who will assist you all through the process of buying a used forklift. All used forklifts that are remodelled by Lencrow operate just as brand new forklift models precisely because they often come with low hours. We offer the warranty on most of the used forklifts and can fit them to suit your application upon request. We have a variety of forklift types that include diesel, dual fuel (petrol & LPG) and electric. We have been in the business of providing material handling solutions for more than 39 years now and thus, we can very well help you in finding the perfect equipment to suit the material handling requirements of your business. Lencrow provides forklift hire services to the greater Melbourne and nearby areas. We have flexible short-term alternatives right up to fleet management available and no job is too big or too small for us. We understand that it’s quite expensive to maintain material handling equipment and so our service has been custom-made to suit a variety of business needs. Get in touch with us to know the different forklift rental alternatives that are available. We’ll evaluate your material handling requirements and budget to find the best forklift hire solution for your business. We provide fork and driver service, which is accessible from a minimum of 4 hours, depot to depot. All our operators have vast experience in material handling and adhere to safe working practices always. We can assist you in handling fragile goods to unloading of pallets, and everything in between. The benefit of our fleet management service is that we can custom fit a solution for your business picking from our range of renowned products that are purpose fit. We can find the ideal products to suit your different material handling needs as we have more than one brand in our massive product range. To complete scheduled service requests, our mobile technicians will come to your workplace. Whenever you encounter any kind of issues or are in need of assistance, you can book request for the same. Once you have placed a service request, we’ll be at your workplace within 2 hours of receiving your service request. We make sure that you remain productive by lowering your downtime. At all of our branch locations, we have onsite workshop facilities. That means we can repair major issues and faults if needed. To perform forklift service and repair works, we have state-of-the-art in van technology and workshop facilities, spare parts availability, which is well backed up by our highly qualified and skilled technicians. You may have purchased forklift from us or another company, it doesn’t matter at all, as our service extends to all businesses out there. We aim to provide the best available local support to you at all times. You’ll get assistance no matter what make or model your forklift belongs. For most forklift makes and models, we offer a huge range of forklift spare parts in Melbourne, which includes equipment accessories. You’ll get original as well as aftermarket forklift spare parts. We stock most of the forklift spare parts; however, for the spares that aren’t readily available with us, we’ll usually source it in 24 hours. At all of our branch locations, we have expert spare part interpreters who can assist with enquiries that you may have regarding parts and accessories for your forklift. To make sure we supply quality parts and accessories to suit a variety of forklift make and models, we have an array of renowned parts suppliers. Since the 1980’s, our transport services have been used by various businesses across Melbourne, and we have a vast fleet to meet used and new forklift delivery as well as forklift rental requests. Lencrow’s fleet of tilt-tray forklift transporters in Melbourne are simple to identify with the unique decals, which have won awards several years in a row.